Nutritious food, exciting adventures and quality time spent together are important to families with busy lifestyles. 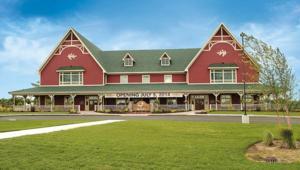 Fair Oaks Farms brings all of these elements together at its family friendly agritourism destination and its new farm-to-table restaurant. The Farmhouse Restaurant, which opened at Fair Oaks Farms in July 2014, provides visitors with delicious food prepared using products and produce grown and harvested at Fair Oaks Farms and other local farms while offering transparency and entertaining educational opportunities. Described as American Farm Cuisine, the menu at the Farmhouse Restaurant features comfort food favorites such as slow-cooked country short ribs, bacon-wrapped glazed meatloaf and country fried steak. Diners can also choose from a variety of starters and side dishes, such as garlic potato mash and Fair Oaks Farms&apos; own mac and cheese. Flavorful salads, distinctive sandwiches and choice steaks round out the menu. Desserts include decadent chocolate or signature carrot cake, country apple pie and Fair Oaks Farms&apos; delectably fresh ice cream. The kitchen of the restaurant is encased in glass, allowing patrons to watch as chefs prepare each plate offered on the Farmhouse Restaurant menu with care. Before the lunch and dinner rushes, small group tours are offered so visitors can see how the restaurant&apos;s food is prepared. The themes of education and transparency are tightly woven in all of the attractions at Fair Oaks Farms. Through the Dairy Adventure and the Pig Adventure, visitors learn how the farms&apos; animals are cared for, from birth through adulthood. Other entertaining attractions at the farm include the cheese factory, where visitors learn how favorite dairy products are made; Green Gate Garden, an expertly planted and raised garden of flowers and produce; Mooville, an outdoor adventure for children that offers a massive jumping pillow and a 25-foot milk bottle that youngsters can climb; and the Café, where visitors can purchase Fair Oaks Farms&apos; award-winning cheese or grab a quick bite to eat. The Farmhouse Restaurant offers a comfortable atmosphere where diners can enjoy lunch, dinner or Saturday and Sunday brunch. Additionally, space is available for corporate or special events in the conference center. Fair Oaks Farms and the Farmhouse Restaurant have made it their mission to not only satisfy visitors&apos; curiosity about food production, but to also satisfy their hunger for farm-fresh food in a family dining setting. Visitors can plan a full and savory day of entertaining education at Fair Oaks Farms and the Farmhouse Restaurant. For more information or to plan a visit to Fair Oaks Farms and the Farmhouse Restaurant, contact Nicki Mackowski-Gladstone, Vice President and Chief Communications Officer for the South Shore Convention and Visitors Authority, at nicki@southshorecva.com or 219-989-7770.